Moments later a BBC/SKY/ITV joint exit poll will be published which may give a clear picture of who is going to win. 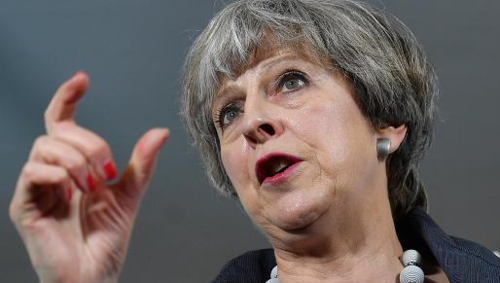 The ruling Conservative party, led by Prime Minister Theresa May, are looking to increase the 17-seat parliamentary majority that they currently hold in the House of Commons. The opposition Labour Party are unlikely to win an outright majority, but could force a hung parliament where neither side holds more than half of the seats. 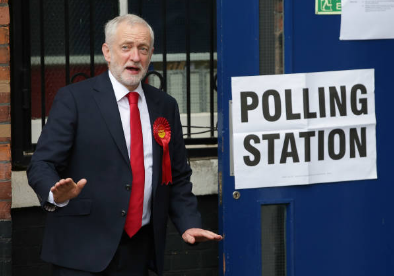 Labour leader Jeremy Corbyn casts his vote. The election is seen as crucial to the Brexit negotiations between Britain and the rest of Europe. The first results should start emerging at around 11p.m BST. 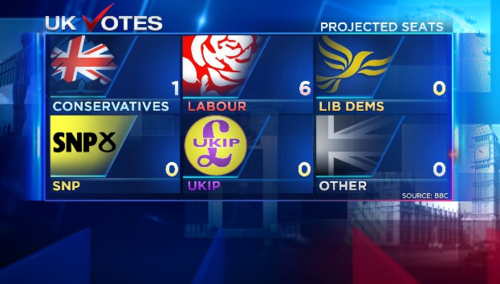 The earliest numbers will likely come from Sunderland and other constituencies in the North East. More announcements will follow until as late as 1pm on Friday. Early results are expected however as there are no concurrent local elections. Befor we get underway properly, our U.S. readers may wish to know why it matters to them. 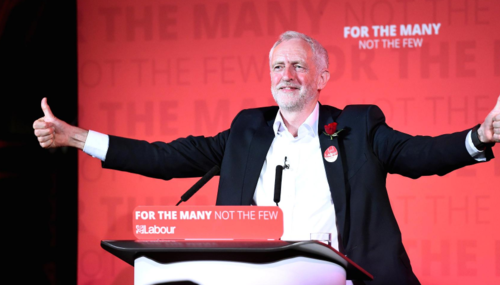 In short, the left wing Labour leader Jeremy Corbyn may have little in common with U.S. president Donald Trump. 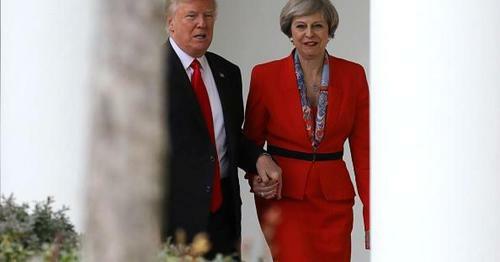 CNBCThis U.K. election is a momentous one for international spectators – not least in the U.S., where observers will be wondering what the future holds of U.S.-U.K. relations. 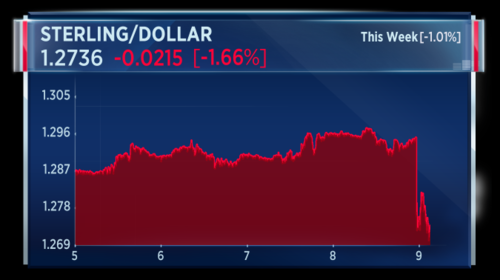 A quick check on sterling reveals a session of little movement today. Since the electuion announcement on April 18, the currency has risen. Analysts ascribe this to a belief that the expected win for the Conservative Party will strengthen their Brexit hand. A contrary view was put forward by JP Morgan who argued that a hung parliament will lead to a "soft" Brexit which would be sterling positive. As ever, it's never straightforward. 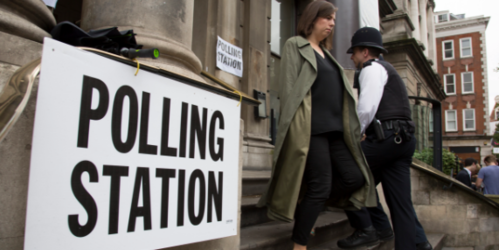 Polling has closed in the U.K. general election and now the process of counting votes begins. Exit polls, seen as a good barometer of the final result, are due in the next few moments. The main joint exit poll from U.K. based broadcasters is suggesting no overall majority for the U.K. Conservative Party although they are the largest party. So with no overall majority, the Conservatives would not be able to overrule the combined weight of other parties. That throws the Brexit situation into disarray and this is the state of sterling. 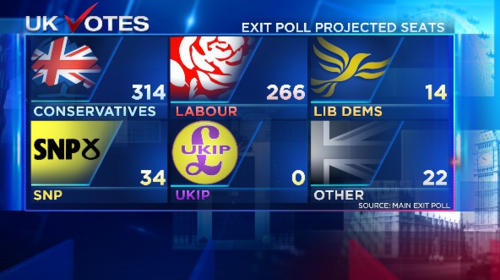 So if the exit poll holds water Jordan Rochester of Nomura says we are in hung parliament territory. He notes the numbers closely reflect the same exit poll in 2015 but that the Conservatives did better with the main result. This is still the Conservatives election to lose with these numbers but it’s a Hung Parliament with a slim majority. 316 seats is the ultimate limit to how long the Conservatives can hold on with Coalitions including the Northern Irish unionists to get them over the line, but it would be a lot less comfortable than it was even before this election was called. 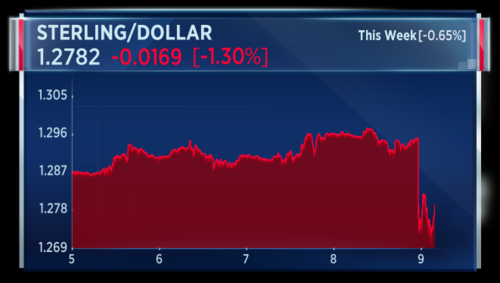 Sterling now down 1.5 percent. Could this man be the next Prime Minister of the United Kingdom. Some call him a Marxist. 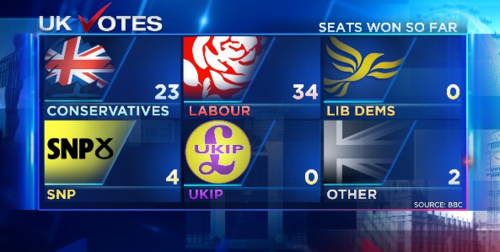 One factor is that the Scottish National Party could lose 22 seats in Scotland. The 56 seat haul they garnered in 2015 was never likely to be replicated but estimates had suggested around 48 seats. The SNP, with 34 seats, would still be the majority in Scotland. The parliamentary seats of SNP "Big beasts" Alex Salmond and Angus Roberston are said to be under threat. With only a slim margin of victory in Scotland, it would seem the SNP might struggle to repeat calls for independence. 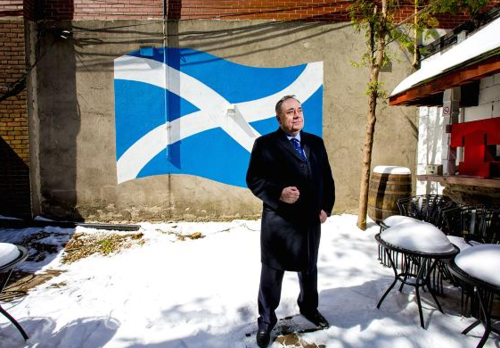 Is Alex Salmond about to lose his seat in Westminster? 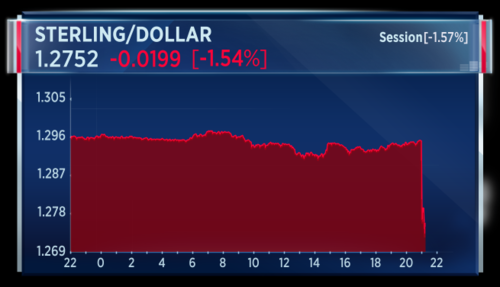 This is the situation with sterling versus the dollar. A steep fall. We are awaiting the first result from the north east of England which is potentially due in the next 15 minutes. 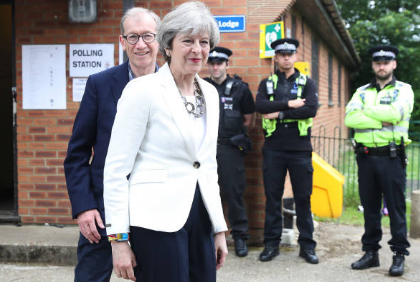 The landslide that had been forecast for the ruling Conservative Party looks unlikely now that the main exit poll is out but how easy it for any party to form a coalition? 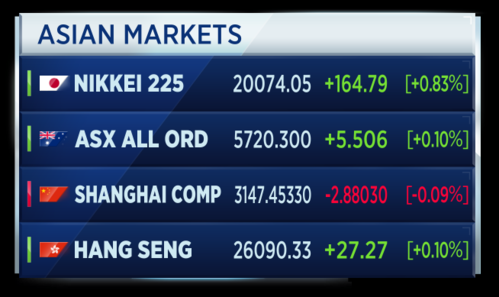 Grant Lewis of Daiwa Capital Markets says it looks like Theresa May is in some trouble. As one pundit has pointed out, this would be the perfect storm of instability with it unclear how any stable government could be formed. Certainly, a coalition between the Lib Dems and the Conservatives seems inconceivable, not least given their polar opposite views on Brexit. 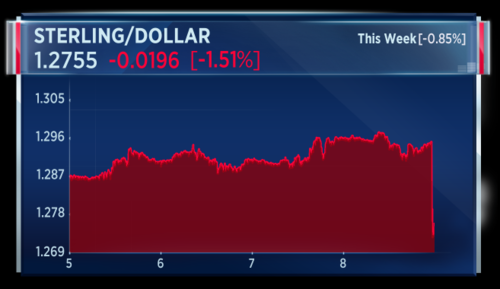 And currency markets have reacted accordingly, with sterling dropping sharply in the immediate aftermath of the exit poll publication. Is Theresa May about to lose her job as U.K. leader? The Labour Party has won the traditional stronghold of Newcastle Central. That northern constituency is the very first result proper. A 2.07% swing from Conservative to Labour. Electorate 55,571; Turnout 37,094 (66.75%, +9.29%). That uptick in turnout could be crucial if replicated across the country. Below is a visual breakdown of how the main exit poll translates to seats. 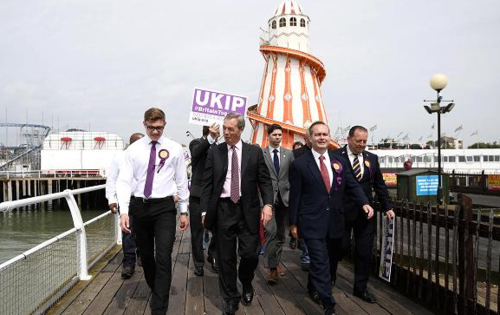 Now we have Sunderland, another traditional Labour heartland. And they take it with around a 12,000 majority. Although worth noting the Conservative vote rose quite strongly. In fact a 3.5 percent swing Labour to Conservative is the opposite of the main exit poll. The co-chair of the European Council of Foreign Relations Carl Bildt is on Twitter. The former Swedish Prime Minister says a complicated result in the U.K. election could mean bad news for a long time. On television, George Osborne, the former Conservative chancellor, said Theresa May may be forced to resign if the exit poll is accurate. But you know we are all talking about a poll. So I’m nervous of making certain statements but look, the problem she will have if it’s anything like that number, she’s got Irish unionists but that does not get you necessarily to 326 and the Liberal Democrats on 14 here are, so unlikely to go into coalition with the Conservatives this time round, not least because they’ve made commitments to things like a second European referendum. 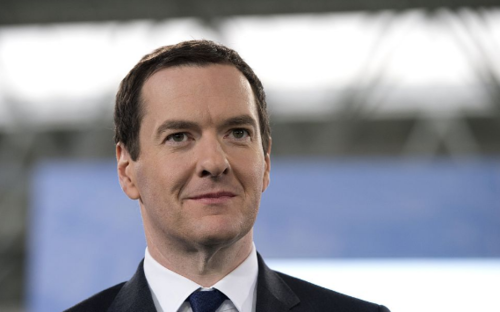 Osborne is now the editor of the London Evening Standard and has been very critical of the May leadership. 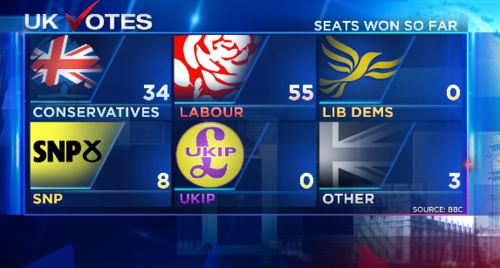 Nomura has made an initial estimate of the Conservatives winning 331 seats. That IS a majority. That is based on both the exit poll and the first two seats. This factors in a small swing to the Conservatives in the two seats called so far. It was not enough to win either seat from Labour but could be crucial in other areas. Now we have Sunderland Central. Labour wins again with 25,000 votes but the Conservative's won 15,000 votes which was better than expected. That again suggest the exit poll is not accurate and that the Conservatives could yet be on course for a majority. 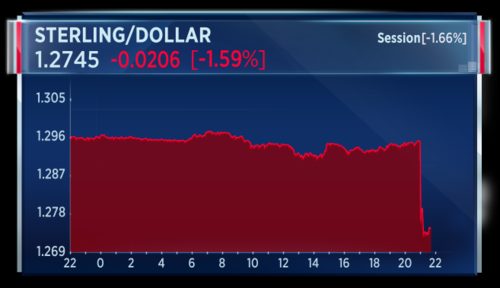 Sterling was 2 percent lower after that exit poll but is now only around 1 percent lower in session. So two more results to report and the first win for the Conservatives. Justin Tomlinson has held Swindon North for the Conservatives, with a 3.7% swing from Conservatives to Labour. And Sunderland West is won for Labour. All those northern seat are more likely to go to Labour. 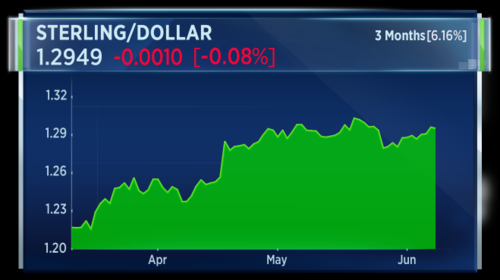 In terms of market moves, we have seen a dip in sterling but little else is reacting. 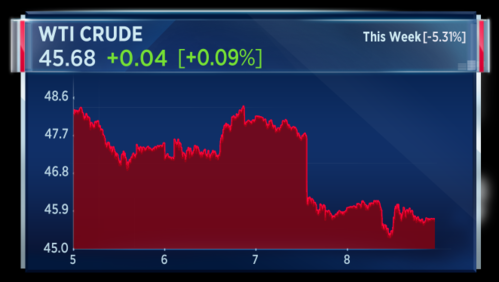 Oil shrugged at 22:00 after that shocking exit poll. 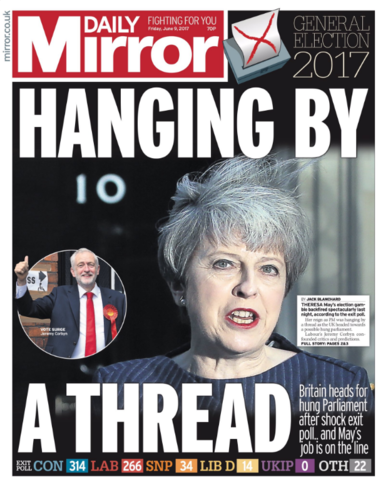 The left leaning Daily Mirror goes early with a controversial headline suggesting whatever the final result, Theresa May's job is "hanging by a thread". One possibility is that the Conservative Party could attempt to rule on a minority basis. This would mean dealing with each issue on a vote-by-vote basis. That would not augur well for Brexit. The Head of G10 FX Strategy at CIBC Capital Markets is Jeremy Stretch. He says the bellweather of Nuneaton has remained with the Conservatives and that might provide a lift to Tory hopes and for Sterling. Even if the Conservatives cling onto Downing St their room for manoeuvre, including promoting a hard Brexit premised on the primacy of immigration over all other considerations is checked. That could eventually provide something of a prop for Sterling. A Nuneaton victory which is a Conservative hold and a Broxburne hold put the Conservatives on 4. The trend appears to be showing both Labour and Conservatives gaining greater shares of the vote from the smaller parties..
One caveat to the exit poll is as recent as 2015 when similar results at 10:00 pm under estimated the final Conservative tally. Polling guru Professor John Curtice is on BBC telling the presenters that the exit poll may well not reflect the strength of the Conservativ evote. Even with a slim majority though, the Conservative leadership could we still be up for change. The political editor of Buzzfeed claiming the current Foreign Secretary is already aiming for the keys to number 10. A hold for Labour in Darlington. That is important because it was seen as a possible Conservative target. Jenny Chapman the Labour representative there and she wins with 22,681 votes. 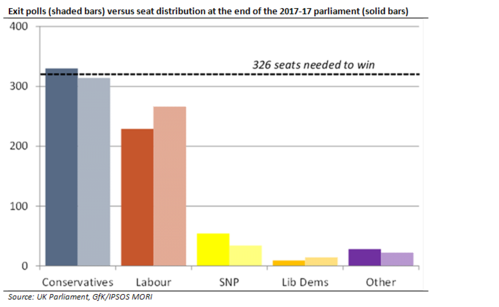 Nomura has updated its election model and now gives a base case scenario of the Conservatives winning 338 seats to win a commons majority. It caveats that by telling us an alternative model they run shows Labour on 317 seats. That would mean hung parliament. On twitter, Brexiteer-in-chief Nigel Farage believes a change of Conservative leader is the main message of the election. Labour has won the Welsh seats of Wrexham and Llanelli. This was another target of the Conservative Party and U.K. leader Theresa May had visited the area several times. As we highlighted earlier the situation in Scotland was particularly hard to forecast and Labour has now won the seat of Rutherglen in South Lanarkshire from the Scottish National Party. That something of a shock. 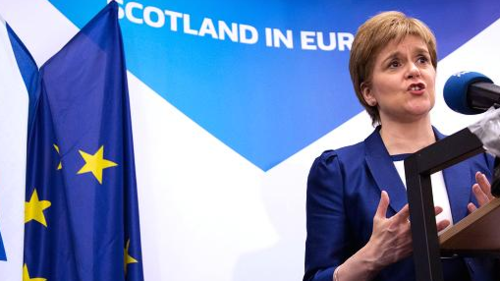 The First Minister in Scotland, Nicola Sturgeon, has previously said she would entertain a working coalition with the Labour Party. The results are coming in quick and fast. Tooting in South London has just declared for Labour. This was previously considered a tight seat but a thumping win for the left-of-center party. Mike Bird of the Wall Street Journal is highlighting this rather astonishing set of odds from Betfair. Some seats for other parties now. The Scottish National Party has won for Paisley & Renfrewshire South. In the 'other' category we have two seats for the DUP in Northern Ireland. That's important because they have heavily hinted they would ally with the Conservative Party. One point to make about Northern Ireland is that Sinn Fein have an abstentionist policy which means the overall number of seats needed to win a majority is actually lower. Betting odds are starting to move in the favor of Jeremy Corbyn. Paddy Power putting Corbyn at 10/11 as the next leader. The Betfair Exchange also switching to and fro now between May and Corbyn as the future Prime Minister. The latest picture we have on the running total looks like this. The Conservatives have taken the seat of Angus in Scotland. This a big surprise given a 16 percent swing from the SNP to the Conservatives. Could Scotland really be a saviour of the Conservative party? Those betting odds are having an effect on those who in turn bet for or against sterling? The former UKIP leader and architect of Brexit has just told the BBC that he may well have to rejoin mainstream politics in order to ensure that Brexit actually happens. He added that a second Brexit referendum might be necessary. Wow. The very latest situation is this. Exit poll predicts the Conservatives will remain the largest party but may be short of an overall parliamentary majority. Labour is predicted to get 266 seats, a rise of 34. 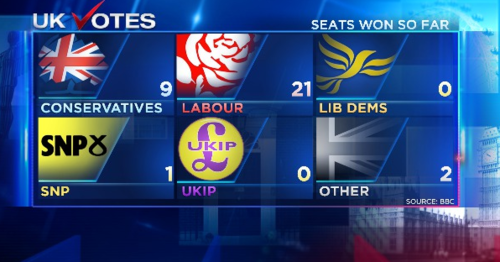 In Scotland the Conservatives are doing well and could provide the seats required for the party to retain power. Angus Robertson has been defeated in the seat of Moray. The winner again in Scotland are the Conservatives with a majority of just over 4,000. 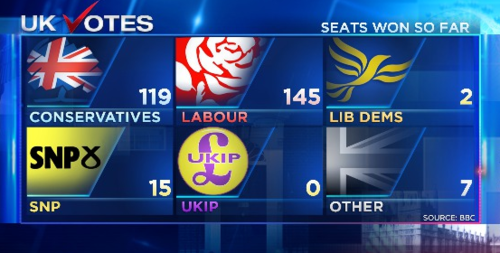 In commentary, the BBC's political editor has said the Conservative party is now not expecting a majority. Lets have a recap of the latest picture across the country. Another win for the Conservatives in Scotland. This time in Renfrewshire East. There is a growing narrative that big wins in Scotland are helping the Tory party move towards a slim majority. 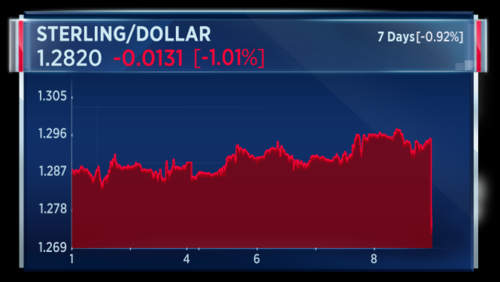 Sterling now down 1.30 percent in session, which is some improvement from earlier in session. In a fairly major development, the former leader of the Liberal Democrats Nick Clegg has lost his seat to Labour. The U.K. conservatives have gained Walsall North from Labour which seems to go against the general theme of marginal seats going towards Labour. For their part Labour have gained Peterborough and Bristol North West. 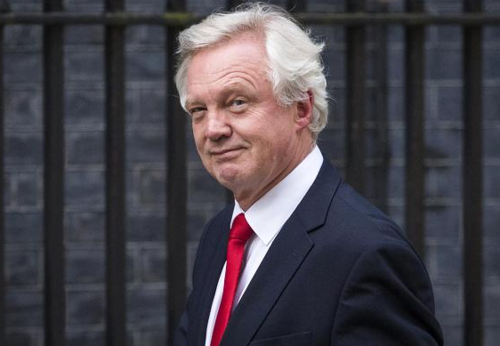 The Brexit Minister David Davis is speaking and says "this is a disruptive election" and that his Conservative party wanted to "deliver on our sort of Brexit". Time again to reflect on the running total. 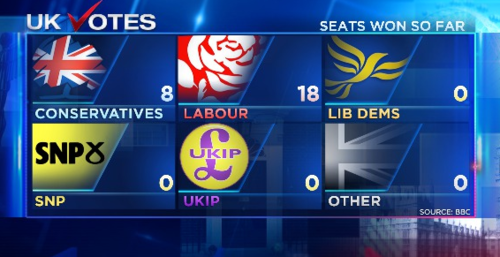 It would appear that the results in Scotland and Northern Ireland could well help the Conservatives maintain power. The BBC's political editor highlighting what would be a major victory for Labour. And Ipswich in Suffolk has gone to Labour's Sandy Martin. Another shock. Jeremy Corbyn, the leader of the Labour Party is tonight's big winner. Unsurprisingly, he has just won his seat back in Islington, North London. In his speech he thanks the crowd for the highest ever win in the borough and the largets turnout since 1951. Corbyn says the results coming suggest the leader of the Conservative Party, Theresa May, should step down. People have said they have quite enough of austerity politics. Is this the next leader of the United Kingdom?